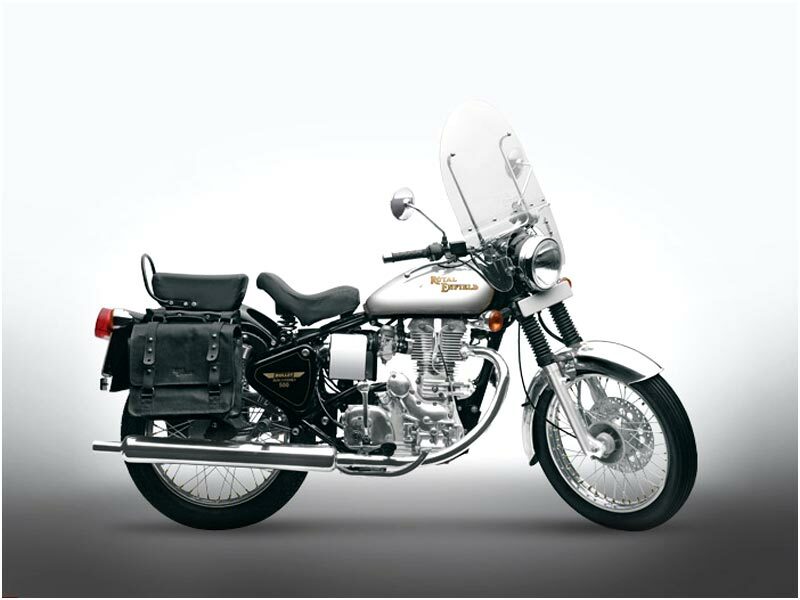 Royal Enfield is a manufacturer of international repute which produces top-end popular bikes across the globe. It has won the hearts of many bikers and attained a cult status. Lately, it has launched Bullet Machismo 500 LB holding the bikers in fascination. Its new powerful 500cc engine is the outstanding feature in this monster. It is Lean Burn aluminium engine and offers a torque of 40.85 Nm. Unlike its previous models, Machismo 500 weighs light as the engine head and block are aluminium-made. The bike kicks start through the Transistorized Coil Ignition which in turn help to derive a smooth ride and battery charging at low speeds. However the great thumping sound found in the previous versions is missed in the Bullet Machismo 500 LB. The bike performs well and it can hit the road as swift as 120 kph. The new Bullet Machismo 500 motor uses the mechanism of high air-to-fuel ratio, which increases fuel efficiency. The aluminium alloy engine not only reduces the weight and provides better cooling but has increased the power from 22 bhp to 24 bhp. The 500cc's stroke length (90 mm) is the same as that of the 350cc, but the bore has increased from 70 mm to 80 mm for the displacement of a bigger motor. The Machismo 500 breathes through a new carburettor and the ignition formalities are taken care of by Transistorised Coil Ignition (TCI). The Bullet Machismo 500 radiates an irresistible look ranged out from its sparkling appearance. The shadow of scars that we find in the previous models due to the wielding has been done away with in this bike. The motorcycle has many a steel part with less paint to give it a pure metallic shine. It has golden color decals on the side boxes and the Irish tank adds to the oomph of the bike. 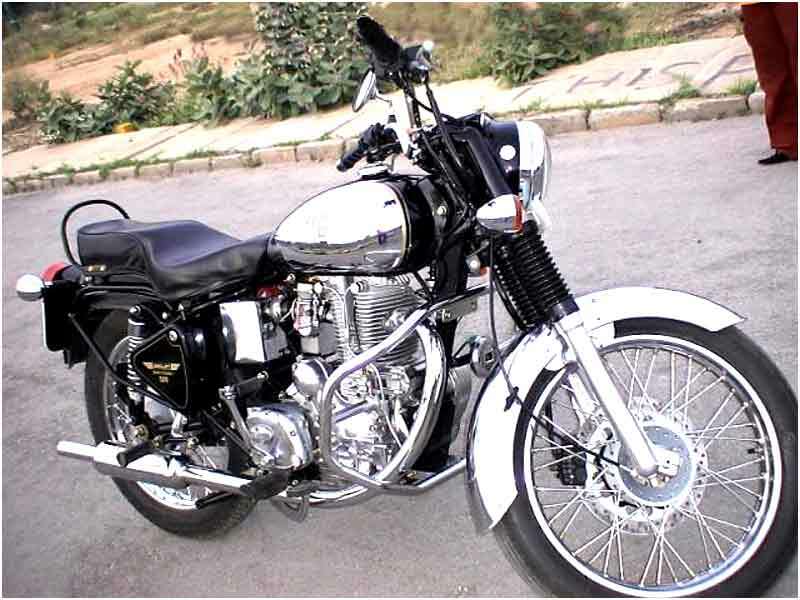 The styling part of the bike is more or less similar to the 350cc Machismo. The seat, the chrome petrol tank and the instrument panel are cribbed from its sibling. The seats are extremely comfortable and the riding position remains the same, which is good for long hauls. It also gets a new round tail lamp which reminds us the old speed king, Yamaha RD 350. However the side view mirrors are too small compared with the body of the machine. The leather saddle bag adds to the aggressive look of the bike. Windshield and the spring -coiled seats can be added if desired. It is a bike that has turned the dream of a bike connoisseur into reality. The brakes are on par with the performance and keep the bike safe all the time with good control over it. The gas-charged shock absorbers at the rear have been equipped to decrease the inherent characteristic of vibration of the bike models. Still vibration creeps in while riding at the high speeds. Machismo 500 has been equipped with the electric start option which is a welcome addition. It is friendly to zip around city traffic in minimum gear shifting and cruises easily at 80- 90 kmph. The brakes are efficient as it comes with a 280mm front disc and 152mm drum at the rear. It returns a sensible 42 kmpl on the highway and 35 kmpl in the city limits. The powerful machine will whizz past the modern hi-fi bikes in its old style with the classic look. 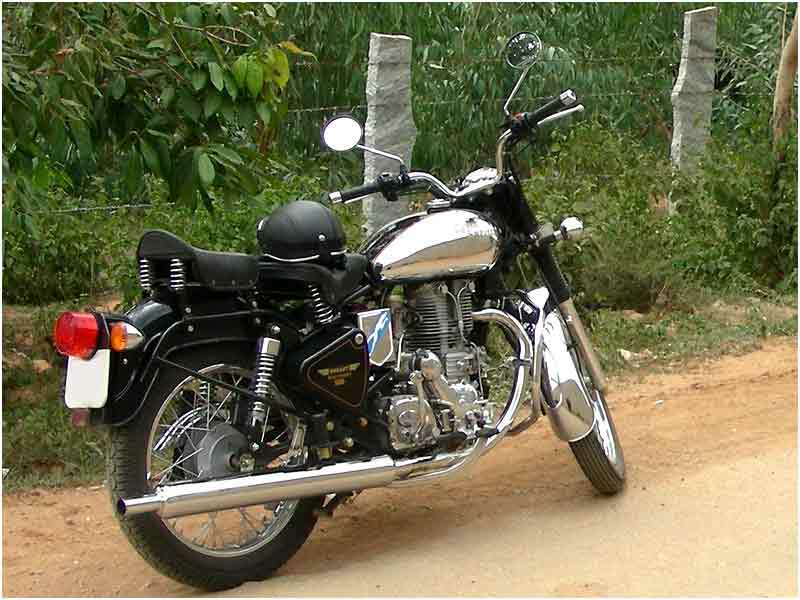 A master product from the house of Royal Enfield, Bullet Machismo 500 gives a superb mileage of 30-33 kmpl. Bullet Machismo 500 LB is available in two colors: Alberto Green and Black. Rear Internal Expansion (Drum), 6"